It wasn’t like Toronto Argonaut running back Dexter McCluster was unhappy with the way his life was unfolding. Out of the NFL for about a year after injuring his right arm in a freak accident at home, the former Pro Bowl player was content to spend time with his wife and kids. Then came a telephone call from a coach at Ravenwood High School in Nashville. 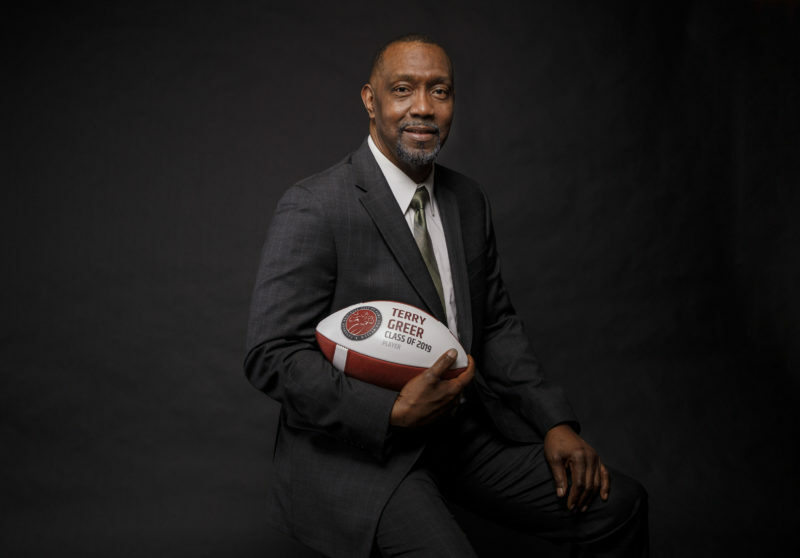 He wanted to know if McCluster, who spent two years playing for the Tennessee Titans, was interested in coaching some high school football players. “Just going there every day and teaching those guys, it kind of brought back that childhood love of the game to you,” said McCluster. 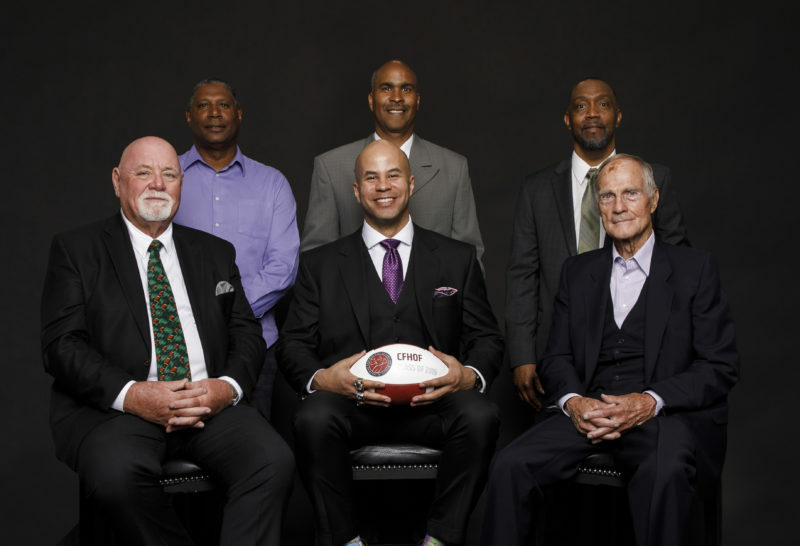 “Knowing that I (played professional football) now I have a platform to help somebody get to where I’ve been. It was fun. Dexter McCluster sprints down field in his CFL debut last month at McMahon Stadium in Calgary (Rob McMorris/Argonauts.ca). 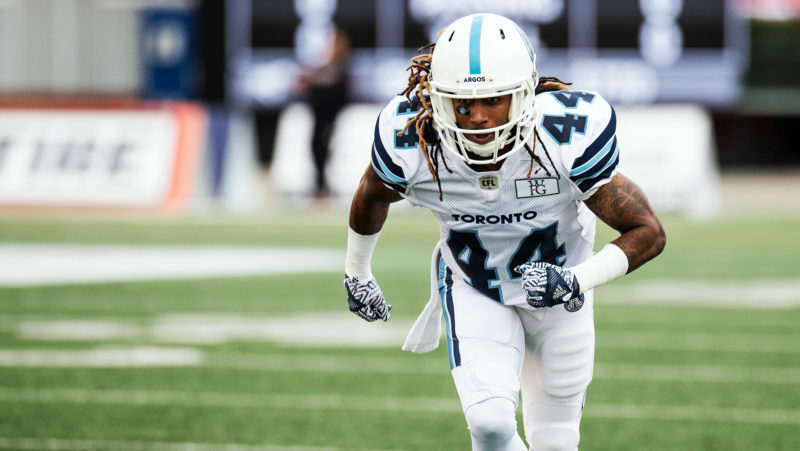 McCluster reached out to James Wilder Jr., whom he had known growing up in Florida, about playing in the CFL. That resulted in him signing with the Argonauts in July. “You kind of feel like a kid in a candy story again,” said the 30-year-old from Largo, Fla., who attended Ole Miss. “You feel part of something. McCluster’s return to playing was delayed by a partial hamstring tear. “That was another setback,” he said. “That’s the mental part of the game. McCluster’s first football game in over 18 months was Sept. 28 in Calgary, where he had four carries for 27 years, plus six catches for 46 yards. He played a bigger role in the offence in Toronto’s 26-23 loss to the BC Lions last weekend, rushing for 53 yards on 10 carries. He also had a 16-yard catch. A friendly man who usually sports a big smile, the five-foot-eight, 170-pound McCluster is on the small side for a running back. What he lacks in size he compensates with speed and power. 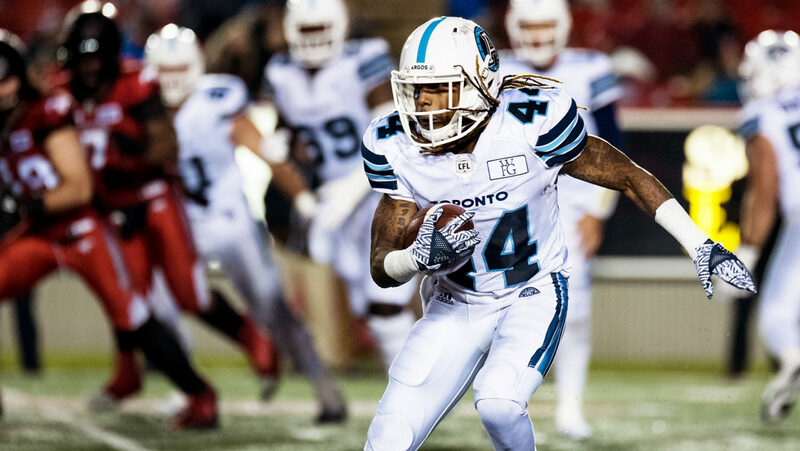 Early in the third quarter against the Lions, with the Argos starting in the shadow of their own goal posts, McCluster bulldozed his way for five yards along the ground. 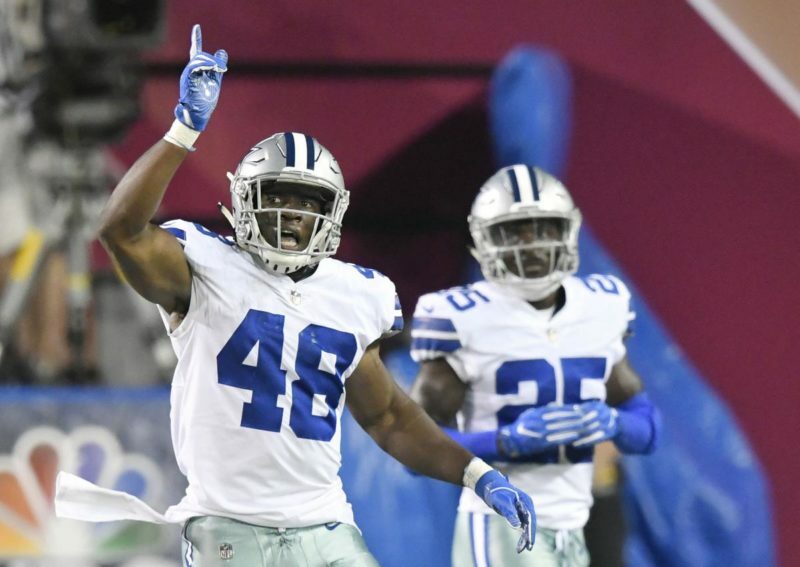 Two plays later he hauled in a 16-yard pass then followed that up with a nine-yard run to give Toronto some breathing room. Head coach Marc Trestman has been impressed with how McCluster has adapted to the Argo system. Some parts of the CFL still baffle McCluster. Early in the year he was puzzled to look at the scoreboard and see the Argos had scored a single point. “I was like where did we get the one point?” he chuckled. Having a college education helps in the transition. “From the running back position, it’s really not that different, it’s all X’s and O’s at the end of the day,” he said. “The protection schemes are pretty much the same, just different terminology. With Wilder sidelined by an injury, McCluster is sharing the backfield with Brandon Burks. They are separated by a six-year age difference but the two men have become close friends. McCluster started playing football when he was seven years old, and even then knew he wanted to be a professional. He was an honor roll student in high school where he lettered in football, basketball and track. 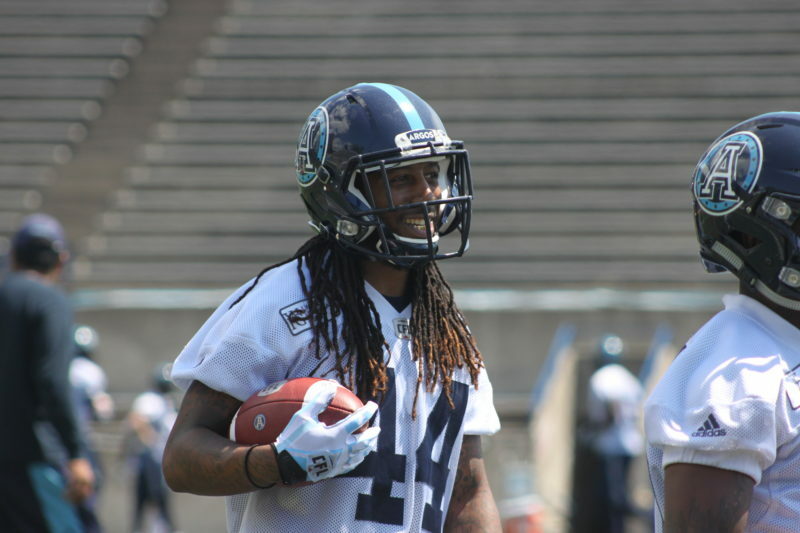 McCluster, seen here in his first CFL practice back in July, had to wait seven weeks before he saw action after sustaining a hamstring injury shortly after his arrival to Toronto (Adam Krueger/Argonauts.ca). His first two seasons at Ole Miss were shortened by injury. In his final year McCluster became the only player in SEC history to rush for over 1,000 yards and have 500 receiving yards in a single season. The Kansas City Chiefs selected McCluster in the second round of the 2010 draft, 36th overall. In his first NFL game he returned a punt 94 yards for a touchdown, setting a franchise record. He was a Pro Bowl selection in 2013. McCluster signed a three-year deal with Tennessee in 2014 but was waived in September 2016. He was signed by the San Diego Chargers in September then fate intervened. He was moving some furniture at home when he fractured his right forearm, ending his season. McCluster attended a minicamp with the New York Jets in 2017 but wasn’t signed. His career was at a crossroads. “You second guess yourself a little bit,” he said. McCluster doubts he would be playing football now if he handed been given the chance to coach with the high school team. “Honestly, I don’t think so,” he said. “I think everything happens for a reason. I was comfortable being with my family, I was comfortable being home. Trestman said coaching at any level puts the game into a different perspective. “A player who becomes a coach sees the world completely differently,” he said. “Dexter is another highly evolved guy, extremely mature. He loves the game. “He came up here for one reason. He recognized he still wanted to play football.” McCluster believes he has several more years of football ahead of him. After that, coaching is a possibility. “I definitely would think about coaching,” he said. “Just having that (time) with those guys, just knowing I can use my platform, things I have been through to teach them.